Between working 16 hours per day on an oil rig, and training for three triathlons in the next month, I tend to work up an appetite. So, I felt a burger lunch was in order. Racks and Tails, a barbecue joint popular among my co-workers, was the chosen destination. After enjoying several of their barbecue offerings -- the pulled pork, brisket, and chicken were all quite delicious -- I wagered that Racks and Tails would also make a good burger. I am happy to report I was not wrong in my initial assessment. 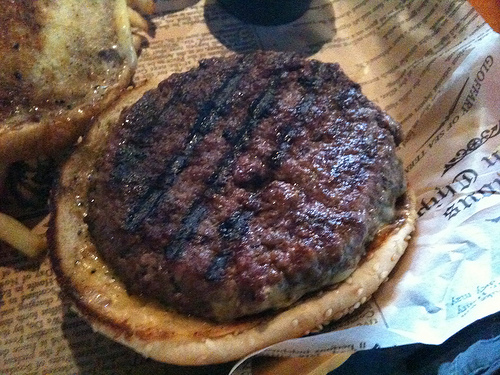 The Beef: It would have been a fool's errand to inquire about the source of the beef, or the cuts used in the burgers. This was an establishment built on slinging barbecue and beer, not catering to burgerphiles. So we'll take their menu's word for it: "hand-formed, fresh ground Angus beef." Do not be deterred from the rather generic description, gentle reader. 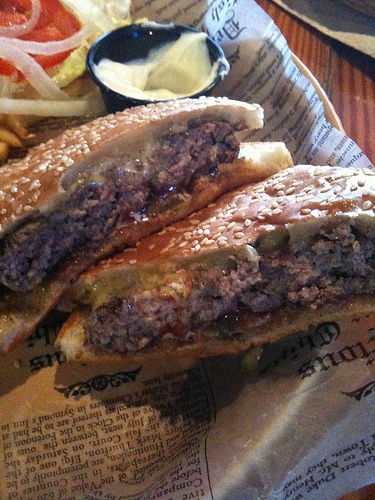 This was a half-pound patty of pretty flavorful beef, probably Chuck, Brisket, or some combination of the two. It had strong iron notes with a pleasant, beefy finish. The patty was a medium grind, and the burger was fairly tightly packed. This provided the right amount of chewy texture to the meat. It was a very tasty piece of beef. The Seasoning: The exterior of the patty was hit with generous amounts of salt and pepper. This worked well with the beef and the open-flame grill. The Sear: Racks and Tails really nailed the sear, in spite of the fact that their burgers were grilled and not griddle-cooked. Strong grill marks were present on the patty, and the remainder of the patty's exterior was beautiful in color, taste, and texture. The Preparation: I ordered the burger Medium, and it came out just right. When cooking over open flame, flare-ups are your greatest enemy. There was no evidence of the dried out portions of meat, which pointed to a high level of attention being paid at the grill. The Cheese: I ordered American cheese. I got American cheese. It was fine. The Bun: The bun was a standard, sesame-seeded bun, common to any food service provider. It was lightly grilled and dense enough to hold up well to the rather hefty patty. My lone criticism was that the bun could have stood up a little better to the moisture (perhaps a little heavier toasting would have done the trick), but it certainly was not enough to detract from the meal. The Meat to Bun Ratio: It was good. The bun was a little bigger than the patty but only by enough to keep the condiments from falling out, but not so large as to leave me with a large serving of meatless bread to finish. The Fries: The fries were OK. Thin-cut, and previously frozen-- they could have been a little crisper. The Value: I had a half-pound burger, fries, and a soft drink for around 10 bucks, plus tip. Not an outstanding value, but good enough for the burger I got out of the deal. Burger Review: Racks and Tails proved that barbecue wasn't the only thing they did well. It was a very good burger, which I have had again since doing this review.